A Chemist Recalls Her Admiration of "The Memory of Water"
Vi played by Susie Moak. Photo by Peter Kuo. The Memory of Water, now showing at Chapel Street Players in Newark through April 28, 2018, was written by Shelagh Stephenson and is directed by Kathleen Kimber. Three sisters come together before their mother's funeral, each haunted by her own demons. The three each have different memories of shared childhood events, causing constant, and often very funny, bickering about whose memories are true. As the three women get together after years of separation, their hidden lies and self-betrayals begin to surface. As is often the case, the eldest sister, Theresa, is the "responsible one." Lori Ann Johnson clearly conveys Theresa’s resentment — that her family has always forced her to subsume her own needs to cover up family dysfunction. In one uncomfortable (though perhaps overlong) scene, Johnson expertly shows us Theresa’s inner battle whether to reveal a family secret that she has kept for decades and at great emotional cost. Middle sister Mary (Susan Boudreaux) is superficially the "successful one." In her professional life, yes. In her personal life, not so much. Mary works hard to distance herself from her mother. Perhaps this is why mother Vi (Susie Moak) only interacts with Mary in dreamlike sequences. Boudreaux navigates the emotional roller coaster well. The opening scene of Act II between Moak and Boudreaux is especially moving. Youngest daughter Catherine (Cyndie Romer) is the "free spirit." But her pot smoking and binge shopping are clearly cries for the attention she never got as a child. And attention she still doesn’t get from a committed, loving partner. Romer skillfully shows us the vulnerability hiding behind the bravura. All of this sounds like a real downer, right? But no! There are wonderful bon mots, put-downs and zingers, delivered with deadpan, spot-on comic timing. And, a hysterical scene when the somewhat stoned sisters play dress up with Mom’s outlandish wardrobe. It is simply wonderful to see an ensemble (which includes Dave Hastings and Frank Newton) gel. It’s clear that they enjoy being on stage together, and that is all to the credit of director Kathleen Kimber. I really enjoyed this production, but I've gotta say, I’m not sure the British accents were necessary and sometimes got in the way of enunciation, especially of rightfully tossed off bon mots which the audience sometimes couldn’t hear clearly. Yes, the playwright is British and the script included a number of British terms and slang. Just saying I might have made a different choice for an American audience. Reflecting on the play itself, I was impressed with the frequent touchpoints on memory, which rose organically from the dialog. For example, that Vi suffered from Alzheimer's. And that Mary is treating a patient with amnesia. And especially the concept that human memory isn’t just some repository of information, but is used to ensure survival. Indeed, the differences in how the sisters remember their childhood demonstrates that each remembers it in the way she must, for her own well-being. And, OK, full disclosure. I’m a chemist and my favorite molecule is water. It touches me to the core that the title of this play is not so much about how we remember water, but rather how water remembers us. That which birthed us, remembers us. Playwright Shelagh Stephenson was known to draw inspiration from science. And to that I can only say (Britishly) — Huzzah! Dirty Dancing – The Classic Story on Stage opened Tuesday, April 3 at The Playhouse on Rodney Square to a very excited audience! Based on their reaction, I assume most (if not all) had seen the movie and knew the story of Frances "Baby" Houseman’s romance with bad-boy dancer Johnny Castle, during her well-to-do family's vacation at a resort in upstate New York. Dirty Dancing – The Classic Story on Stage. The Playhouse on Rodney Square. Dirty Dancing, the film, was a phenomenon. Let’s face it: Most people going to see the stage version are looking to recapture the memories of a blockbuster movie of the 1980s. From what I overheard of people exiting the theater at the close of the show, it did the job! I heard many recounting the first time they saw the movie, comparing the stage actors to the original characters in the film. Yes, this Dirty Dancing stays true to the film. You’ll recognize the dance moves, the music (with a few period songs added), the characters and every famous scene from the movie (you can probably guess them all). Minor changes have been made to this production — including a subplot about the Freedom Riders — but for the most part it, the original tale stays intact. Although some may long for the film actors, I think most will be pleased with many of the actors in this production, especially Aaron Patrick Craven as Johnny Castle and Anais Blake as Penny Johnson. Both are incredibly strong dancers, and it was hard to keep my eyes off them as they recreated those iconic dance moves on The Playhouse stage. Christopher Robert Smith as Dr. Jake Houseman (Baby’s father) brought a youthful feel to his character that was refreshing and that made him a little more relatable. Erica Philpot, who sings many of the famous anthems from the film, has a beautiful voice and brought new depth and feeling to the memorable songs. I admit, like most others in the theater that night, I became a little nostalgic watching the show. It took me back to being 13 years old and seeing the movie for the first time with my family. It was nice to "relive" my youth and the fun of the 80s…even though the show is set in the 60’s! Come relive the time of your life while Dirty Dancing – The Classic Story on Stage is at The Playhouse on Rodney Square through April 8. For tickets, visit www.thegrandwilmington.org or call 302.888.0200. Musical quintet Mélomanie prides itself on creating what they coin “provocative pairings” in their music and partnerships. 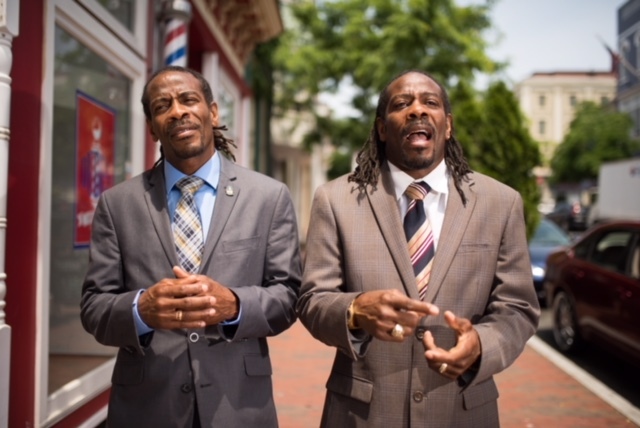 This month is no different (yet very different), as they celebrate a first-time collaboration with phenomenal spoken-word duo Nnamdi Chukwuocha and Albert Mills, known as the Twin Poets and Delaware’s current Poets Laureate. Mélomanie. Photo by Tim Bayard. 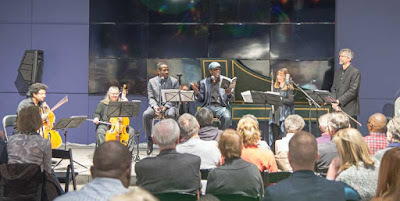 In a program entitled United Sounds of America, two performances — Saturday, April 7, at 4:00pm and Sunday, April 8, at 2:00pm — will be presented at The Delaware Contemporary, completing this mash-up of artistic genres. Guest artist Jonathan Whitney will join them on percussion. The Twin Poets. Photo by Joe del Tufo. Mélomanie asked the Twin Poets for the opportunity to combine their respective art forms and offer a new experience to audiences. “We’re continuing in the earliest traditions of the union of poetry and music,” says Richardson. Richardson says audiences can expect new poetry and favorite past works from the Twin Poets as well as new and favorite music from Mélomanie. 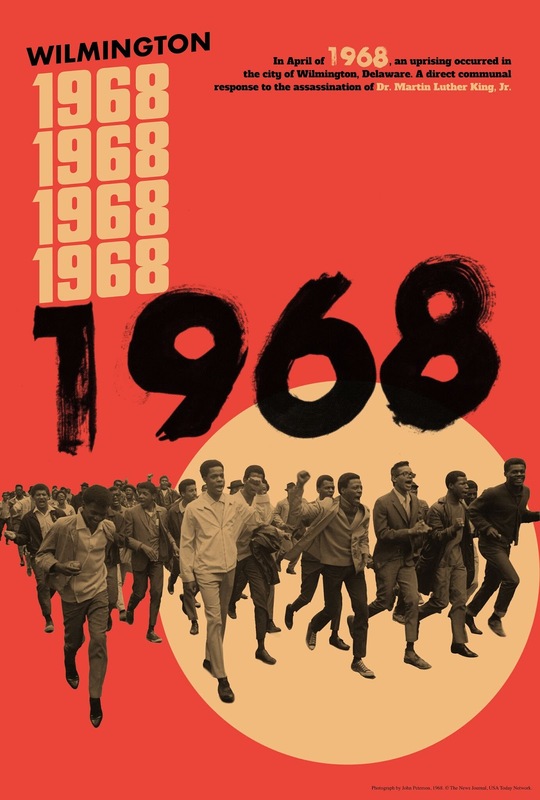 For the performance, the Twin Poets have created a poem reflective of the event title, United Sounds of America. The ensemble and duo will perform together and separately during the program, with composer Mark Hagerty creating and arranging music to accompany the Twin Poets. Mélomanie will perform contemporary regional composer Robert Maggio’s Aegean Airs and German Baroque master Georg Philipp Telemanns’ Chaconne. 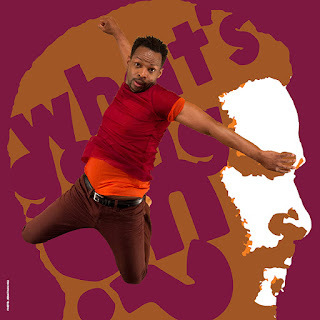 Tickets are $25, $15 for Delaware Contemporary members and students 16 and older. Those up to age 15 are admitted free. Advance purchase is recommended at melomanie.org. Mattias Rucht, percussion. Photo courtesy of Ayreheart. 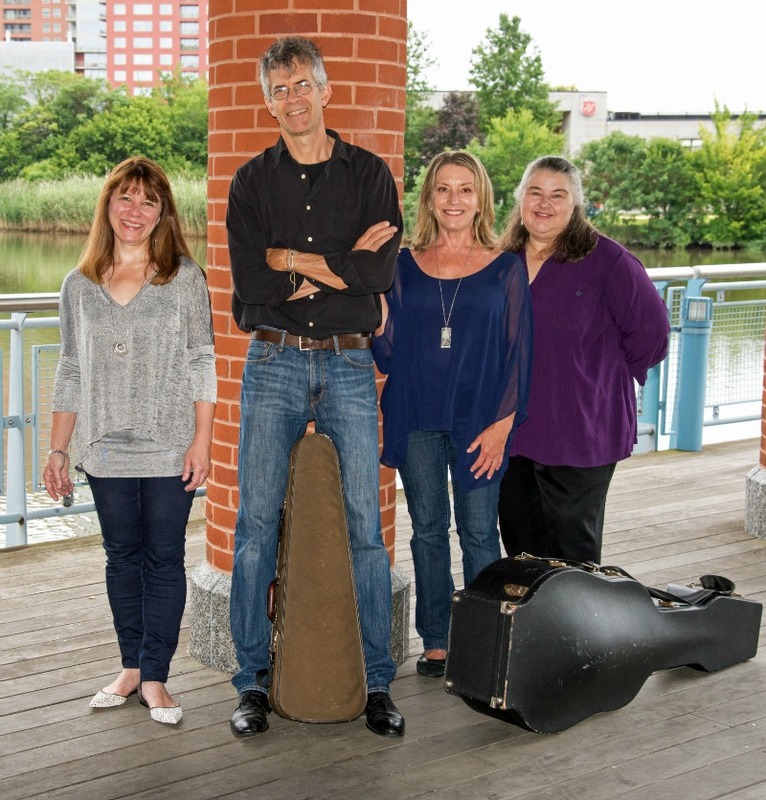 Market StreetMusic keeps its vibrant music roster going into spring with the return of Renaissance-and-modern music trio Ayreheart. The ensemble — Ronn McFarlane, lute; Willard Morris, fretless bass, violin and colascione (a kind of bass lute); and Mattias Rucht, percussion — brings the lute and related period instruments into the 21 Century with all the energy of a traditional rock band. 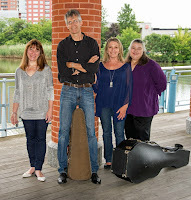 The Friday, April 20, 7:30pm concert is the second appearance for the group in Market Street Music’s lineup. So, let’s back up. What’s a lute, exactly? It’s a stringed instrument (similar to a guitar, although it is plucked rather than strummed) with a long neck of frets, a round body and flat front. Descended from the Arabic oud, the lute was the most popular instrument in the Western world during the Renaissance. The Ayreheart ensemble was founded in 2010 by Grammy-nominated lutenist McFarlane, who had long been writing and performing music for solo lute and found many of his ideas were more expansive than for just a solo instrument. The last time Ayreheart played at Market Street Music, they presented an all-Renaissance music show. This time around, McFarlane says they’ll offer up a generous helping of Celtic music as well as his original music in the mix. 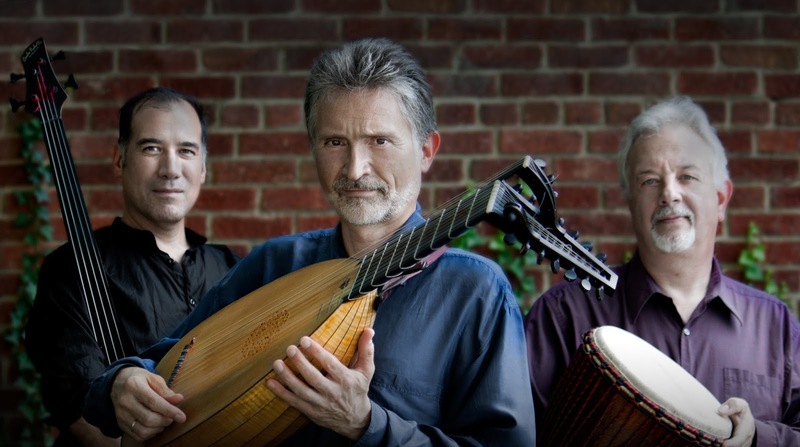 “I want audiences to come away happy and uplifted by our music, but also to hear the lute as an expressive instrument for modern as well as Renaissance music,” says McFarlane. “It’s exciting to break new musical ground for the lute, combining Renaissance and modern instruments, and creating a new body of music that blends elements of folk, Celtic, bluegrass and classical,” he says. Tickets are $20 ($10 students) online at marketstreetmusicde.org and $25 at the door the evening of the show.